New York Yacht Club American Magic, a U.S. 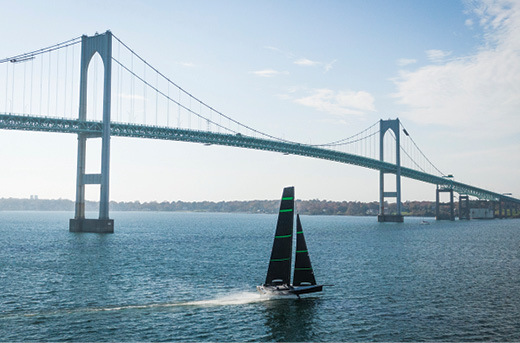 Challenger for the 36th America’s Cup, has named Sail Newport, Rhode Island’s Public Sailing Center, as a Sailing Community Partner. Joint events, programs and projects to boost sailing in Rhode Island and New England will continue through the Newport-based team’s participation in the America’s Cup competition in Auckland, New Zealand in 2021. “Sail Newport’s mission is to foster the sport of sailing and we are thrilled to be able to help mobilize our fan base as American Magic pursues the oldest and highest prize in our sport,” said Brad Read, Executive Director of Sail Newport. “This is an exciting team to follow, and they are committed to helping Sail Newport and its programs. “We are very excited to partner with Sail Newport, which has given so many people in our community access to the water and to sailing over three decades of hard work,” said Terry Hutchinson, Executive Director and Skipper of American Magic. The partnership will include the direct support of American Magic sailors, who will visit Sail Newport’s Pell School Sailing Program this spring and make special appearances at other youth programs. The two organizations will work together to enhance and promote Sail Newport’s youth and community programs and sailing activities with special events, sailor appearances, lectures and digital media content.